Juxtapositions: A cruise liner passing between the islands of Eday and Egilsay on its way to Kirkwall shortly before sunrise on Monday 26th September 2016 as seen from Springfield. Rousay. Above (top right), planet Mercury imaged at visual magnitude 0.0 with an orbital speed of 47.4 km per second. The month of September has proved a non-starter from an observational point of view, by which we mean there have been very few clear periods at night. Usually we expect to get at least four or five decent nights in early autumn before things go down hill for the rest of the autumn and winter itself! The night of September 29/30 offered around two hours of usable clarity. Details below for some aspects of the work undertaken. 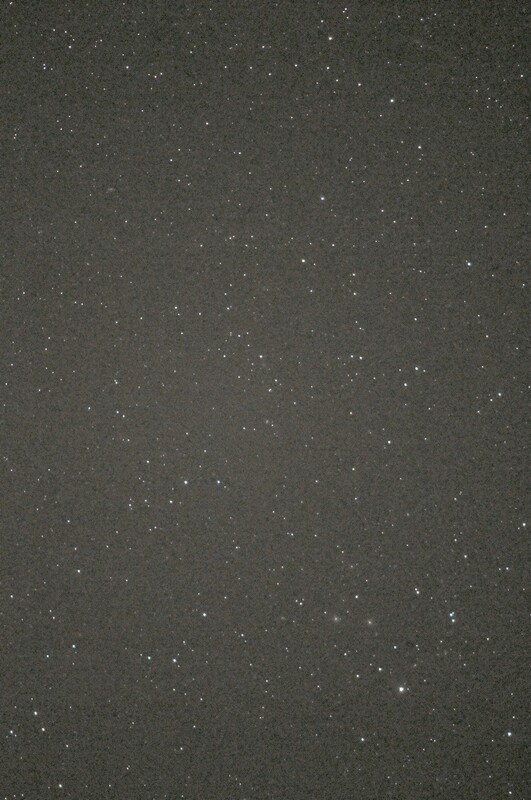 In this photograph (field 1.8˚ x 2.7˚) there are at least 20 galaxies visible at low resolution, and well over that number on the original high resolution image. The image is one of a series looking at Mira class variable stars: super-giant M spectral class stars sometimes referred to as pulsating variables and taking their name from Mira (omicron Ceti). These stars are characterised by having long, irregular periods between maximum and minimum over a wide luminosity range. This field looks specifically at S Pegasi, readily identified at the centre of the cropped image (1.1˚ dia. approx. : note the distinct reddish colouration). Range in luminosity: 1,500 approx. 2014 August 23: The waning, crescent Moon and Jupiter (left) in a cloud-clad sky, looking near East from Springfield at 03h 43m UT. 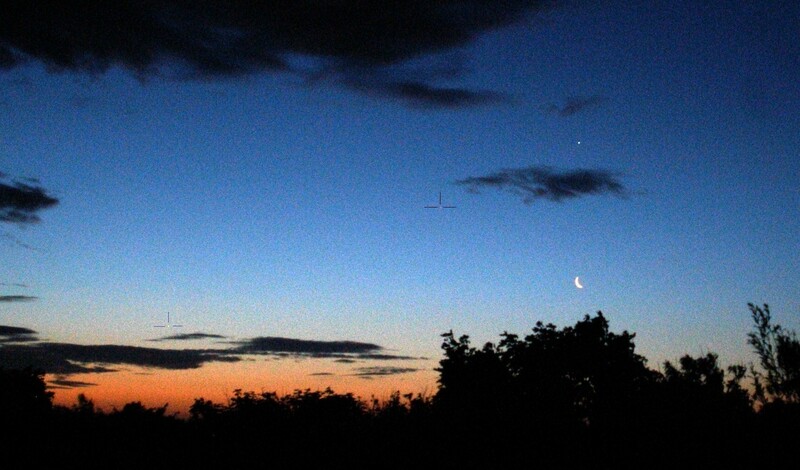 2014 August 22: Early morning sky with Venus, Jupiter and the crescent Moon. Venus, Jupiter and the Moon (from left to right looking in) in the early morning sky in strong twilight 2014 August 22, 04h 16m UT (sunrise 04h 43m UT). 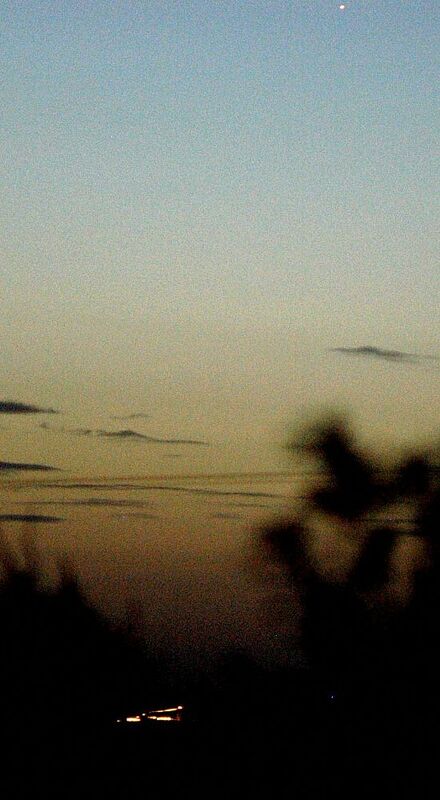 Separations: Moon/Jupiter 16.7°; Moon/Venus 20.7°; Jupiter/Venus 4.0°. 2014 August 18. 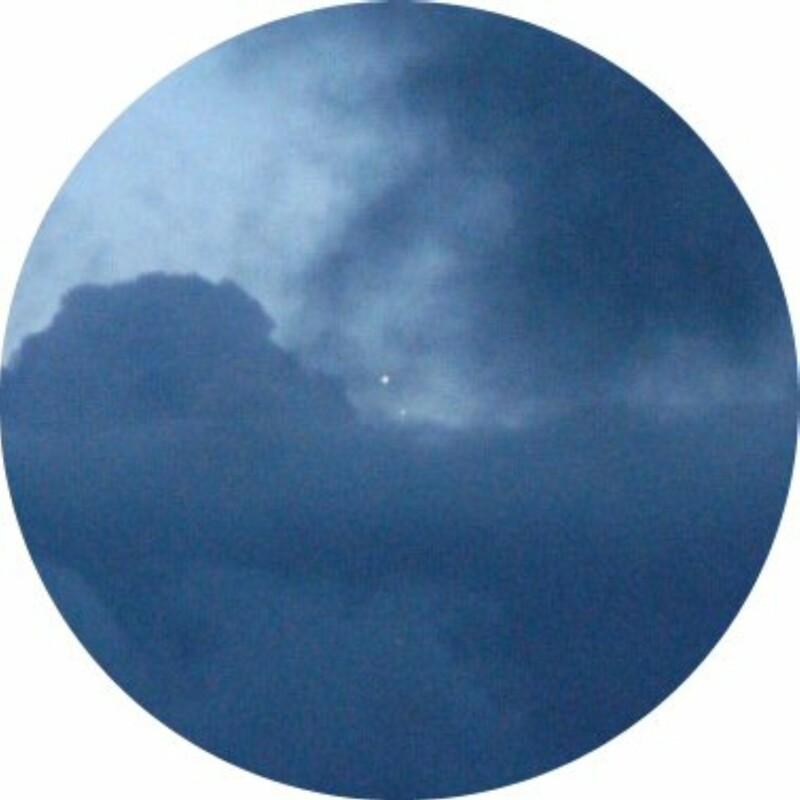 Jupiter/Venus Conjunction. Jupiter Venus Conjunction 2014 August 18. Orcadians will not need me to dwell too long on the difficult weather conditions that have prevailed over the past few days. 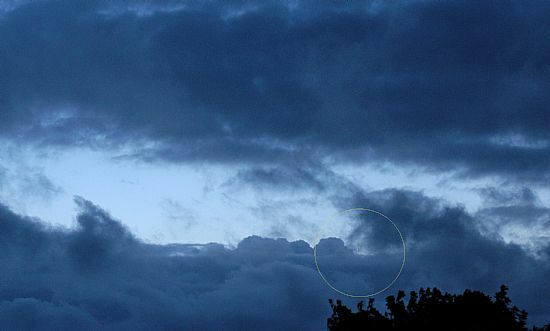 A strong to near gale blowing from a northerly sector driving masses of thick cloud across the sky can hardly be described as ideal conditions for “star gazing”. 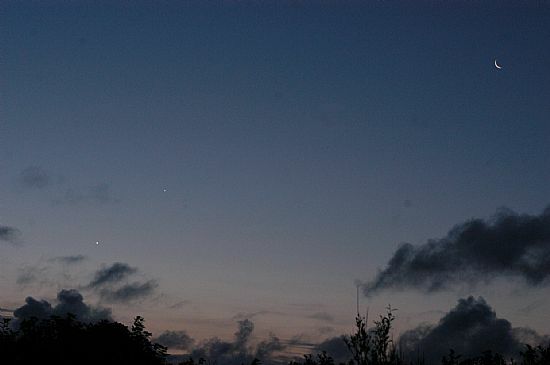 The very early morning of August 18 gave some promise for a view of the two planets as they rendezvoused below constellation Gemini, but conditions worsened as the pair climbed above the horizon providing only a few very brief opportunities to see the event itself. We give images below obtained using a Nikon D100 SLR and 28mm f/2.8 wide angle lens. 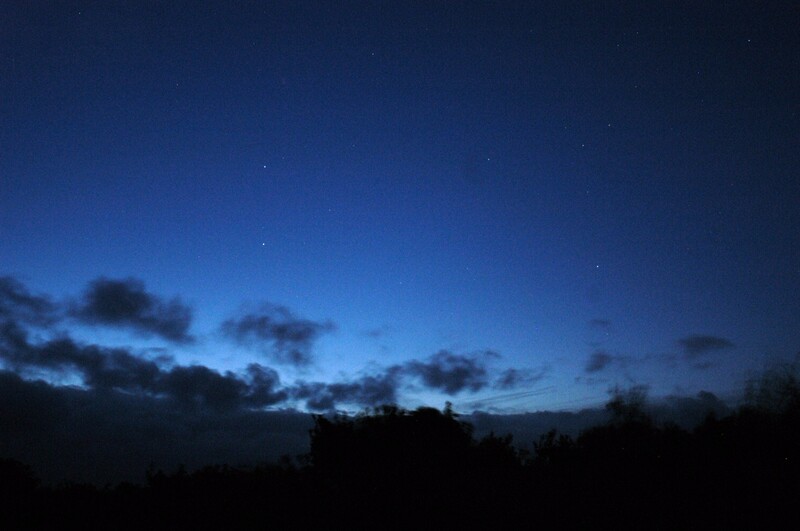 Looking close to east from Springfield, Rousay 2014 Aug.08 at 03h 49m UT. The planets are at the centre of the ring. From the ONE clear night we have had here in Orkney in some five weeks no sign of NLCs. If the weather continues like this into the darker nights ahead this autumn and winter I can see very little prospect for any serious observational work. You will notice, there is no mention of the problems faced by ground-based astronomers. 2014 March 19. Vernal Equinox tomorrow (20th March) and no tangible observations from Orkney for over a week due to apalling weather. 2013 September 09: Imaging Comets – Local Techniques. The evening of September 08 illustrated perfectly the problems we face here in Orkney attempting to image faint astronomical subjects. On Rousay’s east side the sky was beautifully clear at 21h 15m UT. It takes less than 3 minutes to set up the equipment ready to commence work. The equatorial drive will require setting for date and time using 2 reference stars and this may occupy a further 2 to 3 minutes. Our large telephoto lenses (400mm f.l. plus) require calibration for sharp focus according to the atmospheric conditions, mainly air temperature. This may take a further 3-5 minutes. The first exposures on the subject can therefore expect to commence on average within 8 minutes from the commencement of set up. It is then essential to get the work done as quickly as possible since weather conditions can deteriorate quickly. This happened on the night in question. We had no sooner inspected images on the computer when the mist came in, descending from the hills and creeping across from the sea. 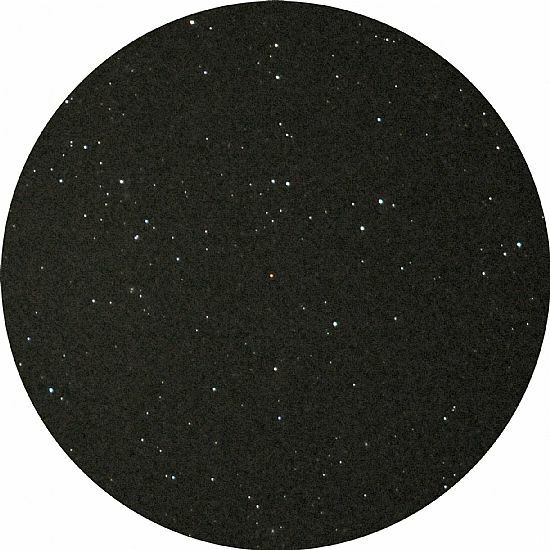 The spectacular images to be seen these days using CCD cameras will require time which, as we have just seen, is not often there to bargain with. Instead, we have adopted the approach of fast lenses in order to secure results in as short a time as possible. The combination of telephoto lenses and digital SLRs may not give the fine resolution obtainable with CCD and telescope, but at least we have something to show for our efforts. 2013 September 03 Cmet PanSTARRS data. A number of readers have asked us to give the comet’s present distance from Earth compared to when it was at its closest on March 05. We give the figures below, together with those for when we first observed the comet from Rousay on March 29 and our most recent observation on September 02. PanSTARRS distance March to September 2013. Auroral/Noctilucent Cloud activity of 2013 August 20/21. 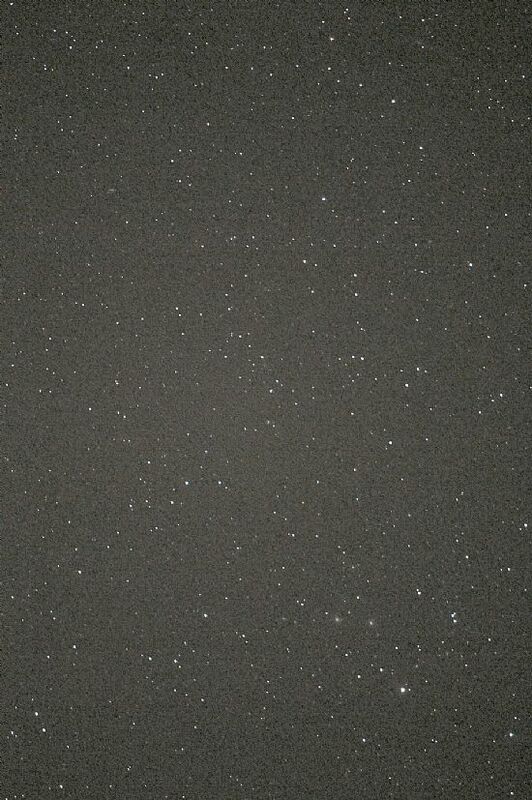 The Early Morning Sky 2013 August 04 at 03m 00m UT. looking NEE from Springfield, Rousay. We were indeed fortunate with the weather to be able to follow the early morning lunar run on all but one of the five days featured in our piece below. The culmination was that of the morning of the 5th August when the sky gave of its best with a meagre presence of the noctilucent clouds in addition to the Solar System “companions”. Some of this will be featured on the GALLERY page within the next few days. The positions of the planets Mars and Mercury are indicated at the centre of the three marker lines on the enlarged version (left click). Jupiter above the Moon, with small bank of cloud between. May 7 2012: Matters Astronomical. First I should like to thank all those who have communicated their appreciation of the SKY NOTES feature. We started this with The Orcadian ten years back come October and shall be celebrating the tenth anniversary appropriately in October. We were fortunate here in Orkney over the weekend in having clear skies to observe the very rare event of a full moon coinciding within approximately one minute of the Moon’s cyclical close approach to Earth. Thanks to the publicity given to this event by The Orcadian well over 2000 people accessed the NORTHERN SKIES site during the past few days. Another very rare astronomical event in the form of a transit of planet Venus will occur on June 5/6 in less than one month’s time. Transits of Venus take place in pairs about every one hundred years. The previous transit in 2004 was well observed throughout Orkney. This year only the latter stages of the transit will be visible from Orkney. Full details will appear on SKY NOTES towards the end of this month. As always when referring to the Sun we must emphasize the need for extreme caution. Never observe the Sun either with or without optical aid unless reliable and adequate filters are used. It is always safer to project the solar disc onto a screen in front of the eyepiece, BUT even here care must be taken so as not to interrupt the light beam. The Orkney International Science Festival celebrates its 21st anniversary this September. I was active with the portable planetarium all those years back at the first festival and hope to present a lecture on the final day of the festival this year (Wed. 12 Sep.). The subject: “Seeking the Aurora”. We should like to thank all those who have contributed to our site and in particular those who have sent encouraging words via the Guestbook Page. This makes it all worthwhile despite the appalling weather we have to contend with at times (most times?). John C V et al.